1983 Kopaonik earthquake occurred on September 10 at 06:14 UTC with a body wave magnitude of 5.3 and a maximum Mercalli intensity of VIII (Severe). 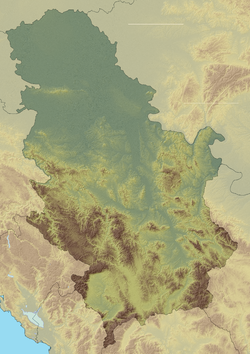 The epicenter was in the Kopaonik mountains of Serbia. It affected seven villages, leaving 200 homeless, and 1,200 buildings and dwellings damaged. Kopaonik was hit five times by earthquakes of intensity VII to VIII between 1978 and 1985. ^ NGDC. "Comments for the Significant Earthquake". Retrieved 27 August 2010. ^ Associated Press (13 September 1983). "Earthquake in Serbia". The New York Times. ^ Roux, Michel (1992). Les Albanais en Yougoslavie: Minorité nationale, territoire et développement (in French). Les Editions de la MSH. p. 93. ISBN 9782735104543. This page was last edited on 18 October 2018, at 01:57 (UTC).